Furnish ____Rockford Model GIS-____ all-welded 1/4" steel separators, ____g.p.m. 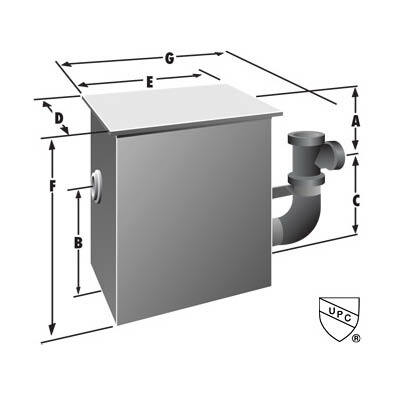 intermittent flow, ____" (tapped), (hubbed) inlet and outlet with tapped outlet vent connection, ____" tapped internal vent connection, ____lb. greasy sludge capacity, visible double-wall outside trap seal, non-removable separator screen with easily removable filter screen, removable heavy-duty cover of steel plate for on-the-floor or partially recessed installation, removable 3/8" nonskid diamond treadplate cover(s) for flush-with-floor installation suitable for pedestrian traffic, or reinforced for (light) or (heavy) traffic, secured with stainless steel flat head screws, heavy-duty leakproof gasket, OPEX® Shop Coat coating inside and bituminous coating outside. Flashing flange with or without clamping ring, filter media, cover(s) with lift handles, integral extension to grade, epoxy coating. All stainless steel. Double-wall construction. These are designed for commercial and industrial applications. + Internal vent connection is located on outlet wall, right-hand side of the outlet. * Also available with 8" or 10" inlet and outlet.